This past weekend was a whirlwind of wonderfulness. Saturday I went down to Freeport for one day of the NETA Spa Knit and Spin weekend. I met some friends down there and we enjoyed the whole day at the Hilton Garden. All kinds of vendors inhabit one of the conference rooms and attendees sit and spin and knit in the hallways and all the public areas in the hotel. There are massage therapists available and a pool as well! Sunday afternoon I went to a birthday party at a small restaurant in Damariscotta that was very lovely. Savory Maine is a wonderful local eaterie that serves local and organic foods. It was a good time and a delightful way to end the week off. Big sigh. Back to work! It hasn’t felt like much of a winter. A break from the craziness of work is welcome, however, as shearing is just the beginning of upcoming farm events. 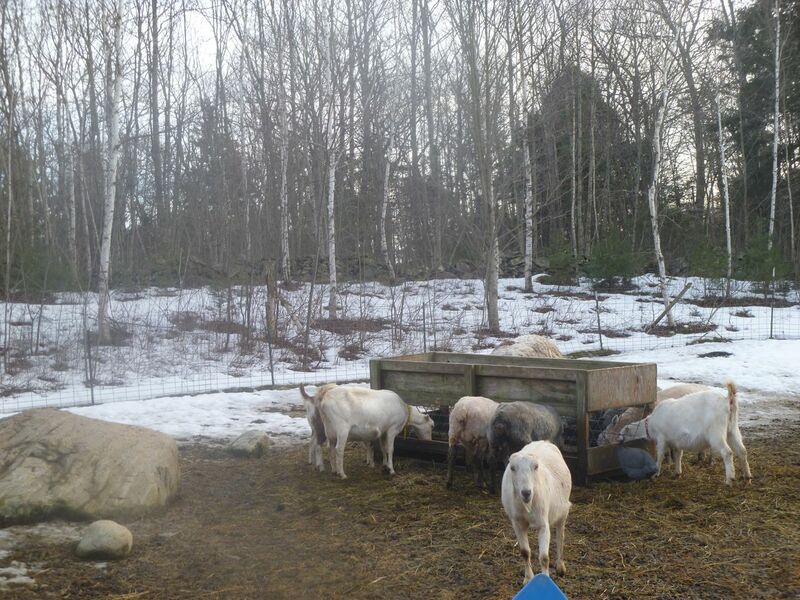 Everything is now focused on getting ready to welcome our lambs and this is the week that I need to be organizing that. In the meantime we are certainly enjoying the mild weather. I took advantage of the sun and 40 degree temperatures to wash some fleece yesterday. 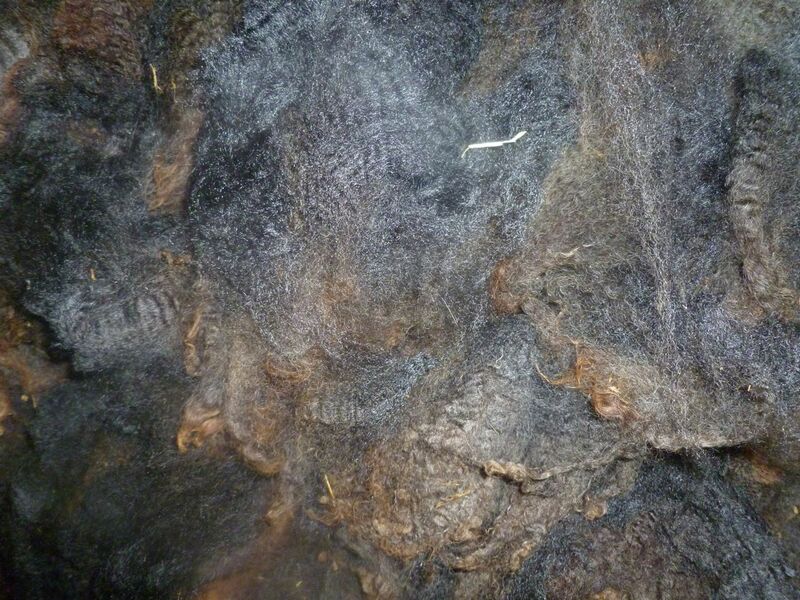 I love the smell of lanoliny fleece in the kitchen sink. The aroma of the fleece and the roasting chicken in the oven were a very satisfactory way to spend the afternoon as I dutifully cast on for my knit-along sweater. Unfortunately, they are predicting some rain for this morning and then snow tomorrow. You just never know. And so today brings the first weekday of February break. I am working on finishing up the knitting on a hat for a friend and then I want to get back into the fleeces and see what is here. I never had a chance on Saturday to get a close look, but maybe later it is on the schedule. Yay for a relaxing morning! The girls are ready for the un-coating! Finally. This week has been insane. One more work day until winter break. Phew! This actually may be the third night in a row that I am eating a piece of toast for dinner. Meetings have been the word of the week, and it feels as if I have not had a moment to breathe. I certainly have not had a moment to keep up with this blog! When I got home today I rushed out to set up the greenhouse and lock the ewes in as we are probably going to have freezing rain tonight. And rain tomorrow until midday. Gotta keep those girls dry if we can. Everyone cooperated and I was able to get the donkey into her own area, as well as the goats and Zorro the Llama out of the enclosure. They still have enough shelter from the storm in the front of the greenhouse, and hopefully there is enough straw on the floor where the ewes are hanging out to keep their fleeces as dry as possible. I *should* be cleaning in anticipation of Saturday’s day of shearing and spinning. I am really looking forward to it, but the house is not quite ready yet. Our shearer, Emily, will be arriving on Saturday around 9:30, shearing our 7 ewes, and then we should be having a wonderful potluck lunch with our intrepid volunteers, followed by an afternoon of spinning and knitting. It can’t get any better than that. 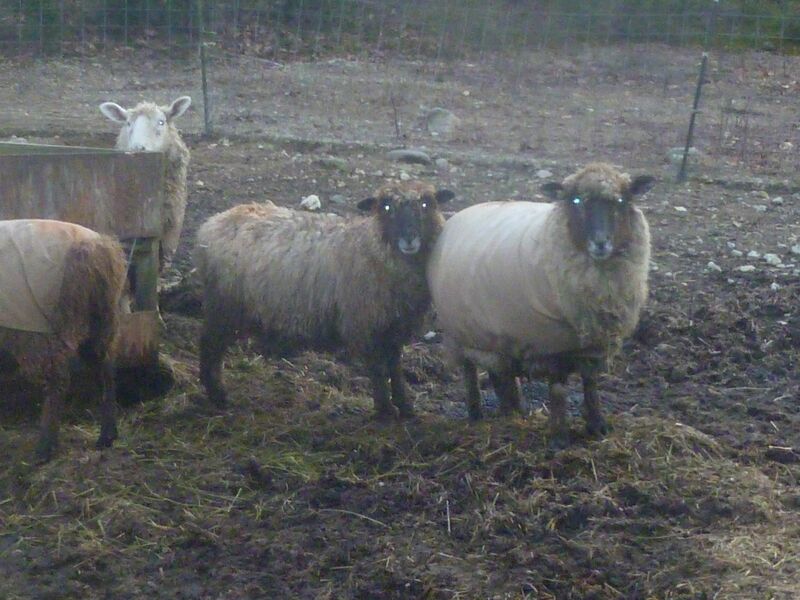 I am dying to see our ewes’ fleeces, as well as getting the first truly close look at their bellies and their udders. The anticipation is palpable as we see the girls undressed and check to see if there are lambs in there doing the baby dance. Lambing begins in March! Lucky for me that I spent the time to do them! Most of the spinners in our spinning group are attempting a knit-along sweater of their choice, and most of them are already into the project. I dyed the yarn for my cardigan with some variation in color, but I tried to keep it fairly well within the same color ranges. Over the weekend we had our grandson for Saturday and part of Sunday, so it wasn’t until Sunday night that I got some gauge swatches knit up. The first swatch I did was a small one. 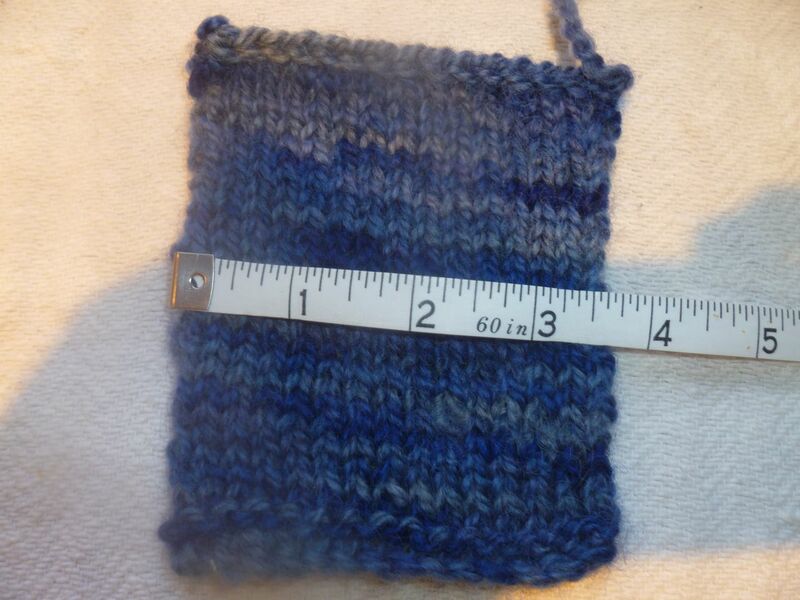 The gauge is supposed to be 16 stitches to 4″, so I cast on 16 stitches and knit about 4 inches in length. The pattern calls for number 9 needles, but I am quite a loose knitter so I tried number 7s with Addi Turbo needles instead. The swatch came out way too big. So I went to a size 6 needle, but of another brand (ChiaoGoo). 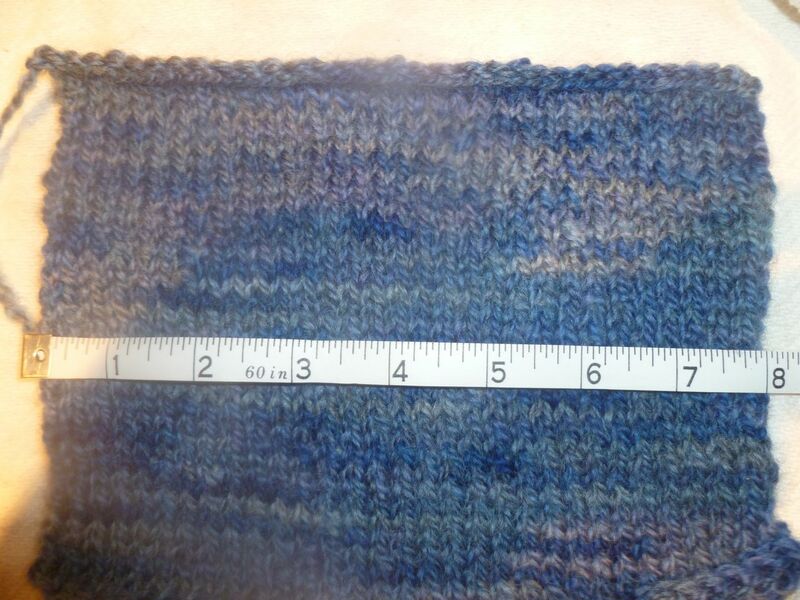 That swatch came out 1/2 inch too small, which multiplied over a whole sweater would spell disaster! So I did another small swatch with size 7 needles and got the perfect swatch! Exactly 16 stitches for 4″. Sounded good, looked good, but for the ultimate decision, I decided to do a large swatch. So with the size 7 needles I did a double sized square, starting with 32 stitches cast on. During the Super Bowl I knitted away while watching a movie, and when I figured I had enough of a large square, I cast off and washed and blocked my large square. Hmm. Not the result I had expected! I again had another result. Not the one I was hoping for! As long as I was this invested in the project, I thought that I would do another large swatch, but this time with the size 6 ChiaoGoo needles. Well, after the second swatch was done, I was really in a quandary. The size 7 large swatch was too big, and the last swatch on size 6s was a teeny-teeny bit under. So I had the choice: use the size 7s and knit the sweater one size under my target size, or use the size 6s and do the larger size. Sigh! So I used the tried and true method: waited until our friend Pam came over and showed them to her. 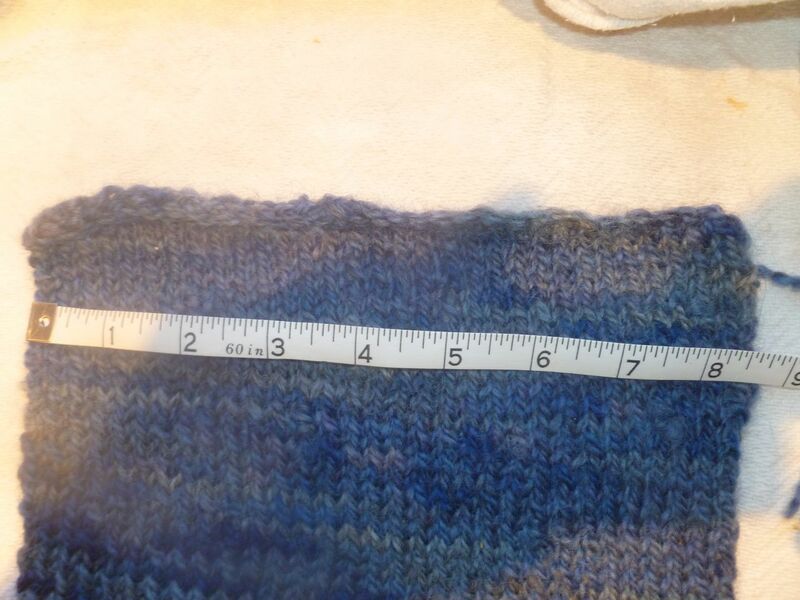 The fabric of both swatches was very nice, and I think we now have agreement, that I will use the size 6 needles. Who knew that different makes of needles would have such different results! This time of year is always a little sad. It is the 37th anniversary of my father’s death. I was 19 or 20 when he was killed by a drunk driver on the evening of January 30th, revived, and lived for 1.5 days, then died on this date. 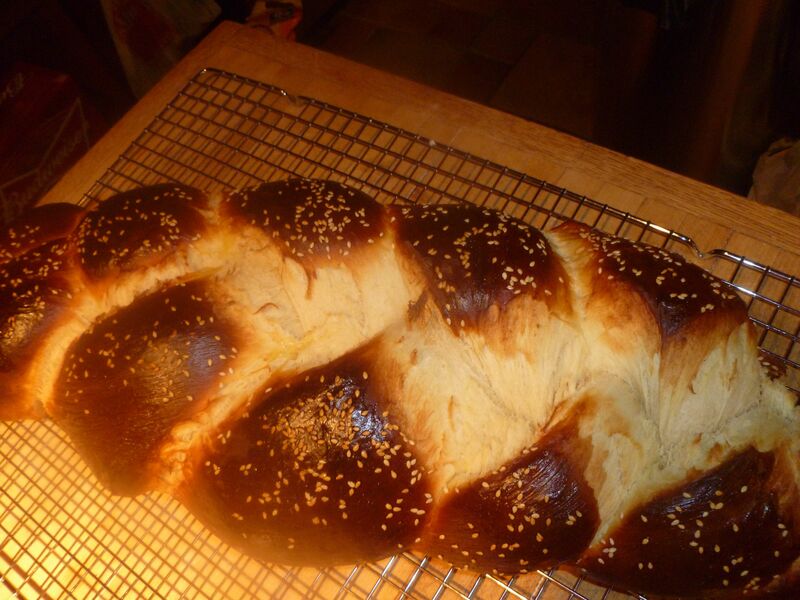 I was living in Jerusalem at the time and by the time I reached NY, he was already dead. I was poking around over the weekend and decided that I needed to clean off the desk up in our loft. I am a collector of paper piles and tend to move them from one place to another (what a shock!). I really need to use the desk, which was my dad’s, and got to cleaning and sorting. It is a vintage 1940s or early ’50s Herman Miller piece. My father loved their Herman Miller furniture, and we still have some of the cabinets and the desk. 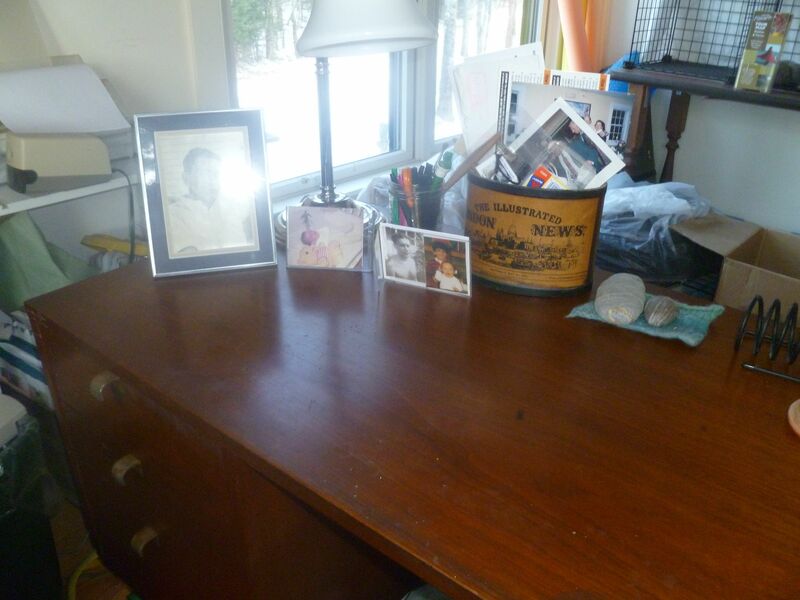 After my dad died my mom used the desk as a dressing table, and it’s been neglected, dripped on and ignored. The wood is very dry, and when I moved it up to Maine it got pretty scratched in my very unprofessional packing of the truck. I had the chance to give it a coat of some wax with lavender essential oil, so I hope it helps. It definitely looks and feels a lot better. I do this every year or so, and it never seems to make much difference, but even with all its scratches and stains, I adore it! My dad would have loved what we are doing here in Maine. He was looking forward to an early retirement, and had always wanted a flock of chickens and a much bigger garden than they were able to have in the house that I did most of my growing up in. He loved his garden and loved to cook, like all of his siblings. He gave me a lot of opportunities in life and we were very close. He never knew my boys, and now our grandboy, but I am always aware of his love and calm perspective on life. He was a great guy, and it really never gets easier not having him around. Our friend Chris came over on Saturday and we had some soapy fun! 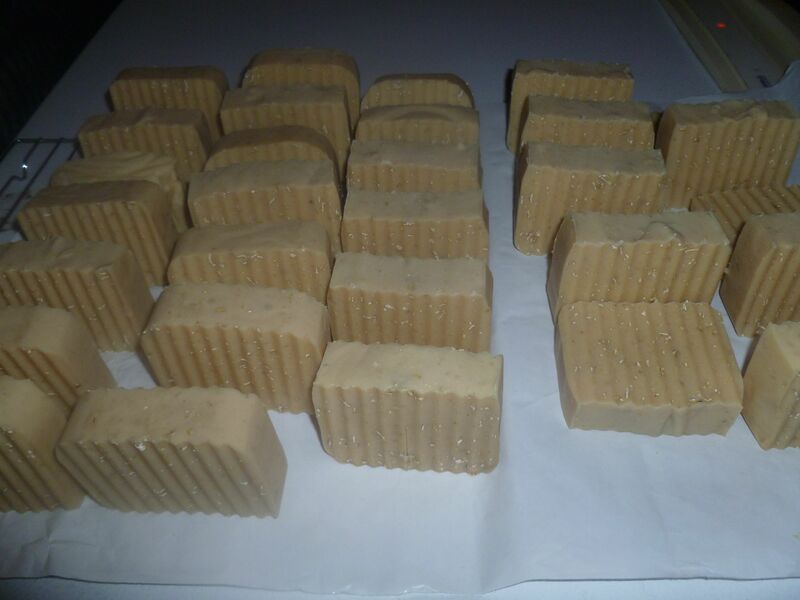 I have definitely not been keeping up with my soap-making and my inventory is seriously depleted. I am freezing some goat’s milk in exact amounts for the recipe I use on a regular basis, so I am prepared in case I really do dry off the two does. It was a fun day, and we enjoyed a nice lunch and some soapy goodness. I cut them on Monday morning before I went to work and they are now to the curing stage. The spearminty aroma when we come into the house is amazing!